Fabric for Shirred Top, originally uploaded by the workroom. This morning started off with a quick stop off at Kinkos (at Bloor & Spadina) to do some copying. Since it was such a sunny morning, Maisy & I walked down Palmerston to Queen Street and then across to the shop. I couldn’t resist stopping in at Kensington Market Organic Ice Cream even though it was before 11am. Ice cream for breakfast is perfectly acceptable in my world. I got a cone of their cinnamon ice cream, which was super yummy. I think it’s time for me to get out my ice cream maker. Often times when someone buys the last bit of fabric off the bolt, there is an odd-sized piece left over. People worry they are leaving me with something I won’t be able to sell. What?! Not one bit of fabric goes to waste at the workroom. These odd bits actually go right into my growing collection of fabric. This particular fabric is called Connecting Flowers by Art Gallery Quilts. I’ve been plotting to make something out of this fabric since it arrived, but it keeps selling out. When i was left with .7 metres of this silver grey and yellow treasure last week, I knew just what I was going to do with it. A while ago, I had read Field Guided’s post on shirring and saw the darling dress she made from some Henry Glass bicycle print fabric. Cute! 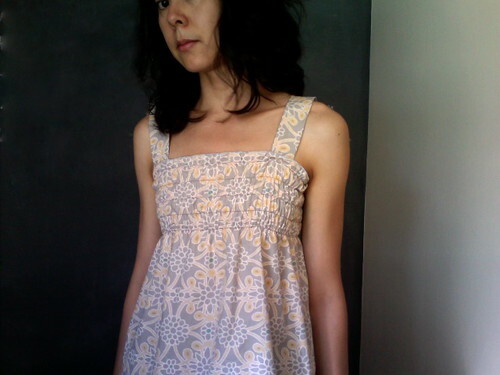 Then a couple weeks ago Toast ‘n’ Eggs asked me if I could teach her how to do shirring. Now that I’ve done it, I think everyone should! It’s very easy, totally satisfying and the results are impressive. I thought I would make a wider strap and I like the way they turned out. The straps are 1.5″ wide. I ran the remainder of the fabric through the serger with some silvery embroidery thread to finish the top and bottom edge with a rolled hem. The rolled hem is definitely my favourite finishing technique right now. For the shirring lines, I spaced them 1″ apart and did five of them. All you need to do is hand wind some elastic thread onto your bobbin and use a regular thread up top. I’m addicted. You’ll be seeing more shirring experiments from me for sure. Please try this, it will make you so happy. 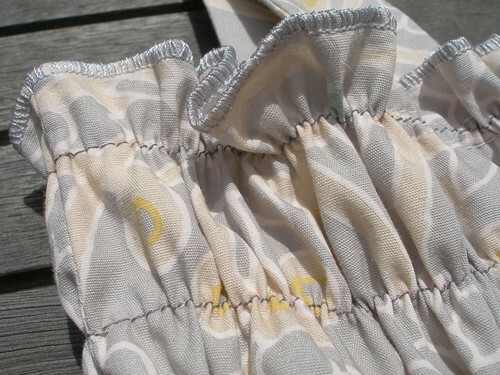 A full tutorial for shirring can be found here. This dress is so pretty! It suits you. Karyn, that looks so cute on you. 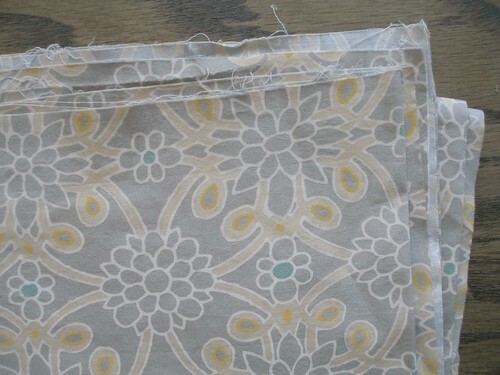 Elegant choice of fabric… Now I REALLY have to get shirring! Dress looks great, and such a wonderful print! And Yay! for the new blog!! hi everybody! thanks so much for stopping by. i’m really excited to be here. what fun! I agree wholeheartedly! Everyone should try shirring! It’s so satisfying. I think I use that word every time I talk about shirring. I also love the rolled hem finish and the beautiful thread — on the first dress I made the hem (just a regular hem) is too bulky. I made another and tried to put a narrower hem on, but it still isn’t as nice as this rolled hem! anabela – Do you find yourself staring at people’s clothing, trying to file away the shirring details for future projects? I think I could devote a week solid of just sewing shirring only. ella – I bought some red & blue plaid for a shirred dress over the weekend. I’m going to try doing some patch pockets on this one. Are you going to post a photo of yours? I’d love to see it! Shirring seems to be the perfect thing for little girls. It’s so easy to make sweet little dresses. Hi Karyn, I love your projects! I bought some elastic thread a year ago or more but have been hesitant to try it (can you wind it on the bobbin with the machine, or do you have to do it by hand?, etc), but your projects have me inspired. Thanks!